Making flavored butter is a really easy way to spruce up any brunch or breakfast party. Homemade honey butter is my personal favorite, but you can add orange, strawberries, blueberries, or a number of other flavorful ingredients. 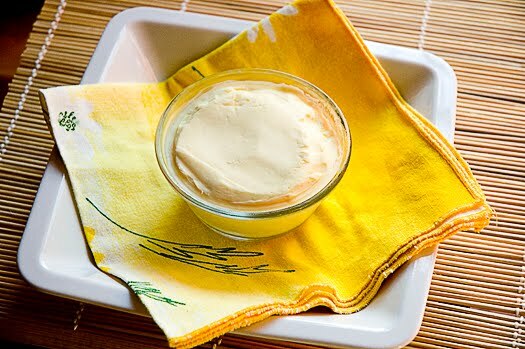 For this recipe I made my own butter from scratch using heavy whipping cream. If you want to REALLY impress your guests, check out my previous post on How to make butter in under 5 minutes! Cut the butter into chunks using a dough scraper. Place butter into a mixer’s work bowl and beat at low speed, using the whisk attachment to loosen the butter. Increase the speed to medium and add the honey, cinnamon, and vanilla extract and beat until well combined, about 5 to 7 minutes. Remove butter from bowl and spoon onto parchment paper or plastic wrap. Roll into a log and refrigerate for 2 hours. Honey Butter takes me back! I used to get it on my bagel from Einstein's Bagels on my way to school! I suggest it to discuss. Write to me in PM, we will communicate. Good post thanksf or th read!